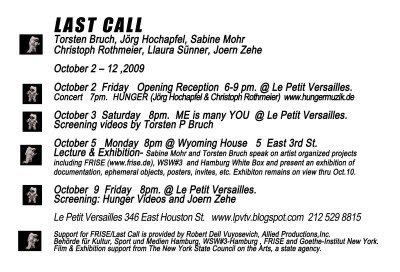 LAST CALL October 2-12 | Allied Productions, Inc.
From October 2 – 12 , the FRISE project “Last Call Hamburg” with Torsten Bruch, Jörg Hochapfel, Sabine Mohr, Christoph Rothmeier, Llaura Sünner, and Joern Zehe at the garden Le Petit Versailles in the East Village of Manhattan serving as “base camp” for installations, music and screenings. Other events are scheduled to take place at Goethe Institut’s Wyoming Building and ABC No Rio on the Lower East Side. October 3rd @ 8pm. ME is many YOU. Goethe-Institut Wyoming Building 5 East 3rd St.
Sabine Mohr and Torsten Bruch speak on artist organized projects including FRISE, WSW#3 and Hamburg White Box and present an exhibition of ephemeral objects, posters, invites, etc. Exhibtion will be on view at Goethe-Institut Wyoming Building thru October 10th. This event is sponsored with support from Goethe-Institut New York. In addition to interventions and installations of individual artists in the park itself, it will offer reports and documentation on how the artists established the cooperative FRISE eG (Sabine Mohr/Torsten Bruch), as well as a lecture on the development of artists’ self-organization in Hamburg, highlighting the WSW # 3. Information material on the many other Hamburg non-for-profit art spaces and projects from the so-called Hamburg Box will also be presented. The focus of this project is the artistic exploration of the use and preservation of public space and public premises – particularly open – green – spaces in a highly developed, urban environment. The small park of Le Petit Versailles in the Lower Eastside of Manhattan, a little paradise in the midst of a highly contested and now highly valued property market, is also a symbol for the artists’ engagement against gentrification and ideally suited as a platform for this project. Closely linked to this is the question of how non-profit-work of individual artists and artist groups can be maintained and organized in such an environment. The experiences, which the Künstlerhaus FRISE has gained in its turbulent history in Hamburg, correspond to the situation in New York on different levels and are addressed in LAST CALL. The project Hamburg LAST CALL traces different levels of information about the circumstances of contemporary artwork and the situation of artists in the city of Hamburg /Germany in general and the specific situation of the Hamburg artist cooperative FRISE. Since FRISE/ alias Künstlerhaus Hamburg e.V. was the first so called artist house (Künstlerhaus) in Hamburg and Germany-. established in 1978, its construction and reconstruction in 2003 – gives an example and a genuine story of how an artist cooperative survived gentrification and (art) market hype. Since 1989 when Künstlerhaus, hosted the ABC NO RIO SHOW “Ten Years Seven Days” the artist collective had to leave their place, find and reconstruct another building. In conjunction with the ABZ a video- and filmmaker organization they established FRISE in 2003. To avoid a repetition of the gentrification story and another foreseeable loss of the new place they eventually founded the FRISE eG Cooperative in 2008 and succeeded to buy the hereditary tenure of the real estate from the city for 1.4 million €. So now 40 artists have a safe place to live and work in FRISE for the next 36 years. PRODUCTION . EXCHANGE, EXHIBITION of contemporary art – 40 artist live and work in the house ( painting, sculpture, drawing, video, experimental filmmaking a.o. ), a guest studio for foreign artists was established to pursue art exchange as well as FRISE artists invite artists from all over the world to stay and work in FRISE. Since 1978 a exhibition program is realized by the FRISE artists as curators, the exhibition space is subventioned by the city. FRISE alias Künstlerhaus Hamburg as an effective cooperation of artists had a strong impact an the cultural policy of the Hamburg city and Hamburg´s artist scene – in Hamburg now has developed an independent art scene with at least 16 to 20 independent art spaces – which have cooperated in the last two years 2007 /08 in an own festival called WSW 1 and WSW 2. The project roughly outlines this development by documents, screenings and catalogues. 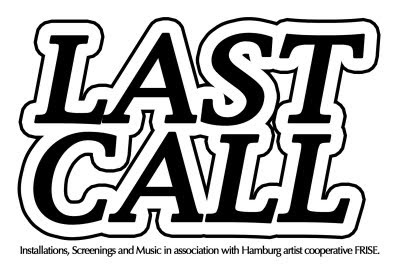 To present the recent video- and filmmaking activities at FRISE “Last Call” will show a video and short film program of members of ABZ and FRISE, like: Torsten Bruch, Jörn Zehe, Christoph Rothmeier. A site specific installation for the garden “Le Petit Versailles” itself realized by Sabine Mohr, Christoph Rothmeier and Llaura Sünner will install a real utopia of Versailles en miniature in the garden. Le Petit Versailles is a NYC public community garden in the East Village that presents a season of events including art exhibitions, music, film/video,performance, theater, workshops and community projects from May – October. Green Thumb/NYC Dept. of Parks, Materials for the Arts; NYC Dept. of Cultural Affairs, NYC Dept. of Sanitation & NYC Board of Education.